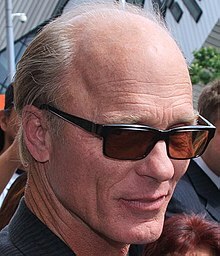 Edward Allen "Ed" Harris (born November 28, 1950) is an American actor, producer, director, an screenwriter. He is best kent for his performances in films such as The Right Stuff (1983), The Abyss (1989), Nixon (1995), The Rock (1996), A Beautiful Mind (2001), Enemy at the Gates (2001), Radio (2003), A History of Violence (2005), Gone Baby Gone (2007), The Way Back (2010), Man on a Ledge (2012), an Gravity (2013). This page wis last eeditit on 28 Mairch 2017, at 04:53.